Oh boy, have we got a gem for you today. Casa Noble Tequila Company doesn't mess about, no way. They do things 100%. And then some. Endorsed by the rock legend Carlos Santana, they're distinct for distilling the Tequila three times instead of the two required by law. The organic estate grown Blue Agave are left to mature for longer as well - for up to 14 years before they're harvested, unlike most Agave plants that are cut after only 7 years. Moreover, they age Tequila in French Limousin white oak barrels for added character and flavor. All of the above helps produce the finest Spirit possible. Uncle Carlos and Uncle Flaviar agree – you can't go wrong with Casa Noble. You see, our friends at the La Cofradia distillery leave nothing to chance. We are talking about exclusive works of unrivaled quality. But even among their impressive lineup, a special prize stands out. 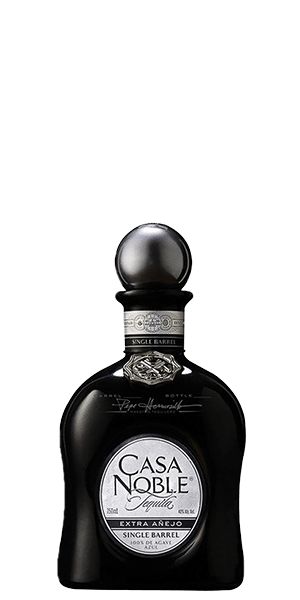 The Casa Noble Tequila Extra Añejo Single Barrel is a limited single barrel edition organic Tequila distilled from 100% blue weber agave by Maestro Tequilero Pepe Hermosillo and aged for 5 years in lightly charred white oak. This precious embodiment of Tequila expertise is presented in a hand-made black porcelain bottle, which is numbered, labeled, and signed by the creators. Each barrel has its unique flavor footprint, but all of them share the richness and complexity that is in a class by itself. No compromises – from start to finish, that's Casa Noble's promise, and that's what they deliver. The simple elegance of a well thought out product, the nobility of Spirit, if you will. There's nothing quite like it, and that's not just a line. Casa Noble doesn't embellish and neither should we. Hopefully, we got you started, but words alone cannot tell the whole story. You just have to try this one for yourself. What does Casa Noble Single Barrel Extra Añejo Tequila taste like? The Flavor Spiral™ shows the most common flavors that you'll taste in Casa Noble Single Barrel Extra Añejo Tequila and gives you a chance to have a taste of it before actually tasting it. Full body with notes of oak, caramel, and agave. Long, smooth with hints of smoke. This was very good. Smooth with a touch of caramel up front. A hint of pepper on the finish. The best tequila at this price point. Loved it. A very nice price point for an extra anejo. More often they are well above 100 USD. My only forays into them are Espolon, Cazadores, and Grand Mayan. All about the same price point (granted Cazadores is well under 100 USD in my area). This and the Grand Mayan are my favorites granted the under priced Cazadores is a close third. One of the best I have tried. So good I already bought another bottle, after only a couple shots. Smooth, hints of vanilla and oak. Price is a bargain. The mouth feel is like a perfectly smooth piece of polished sea glass resting on your tongue. It starts with the beautiful bottle and the taste does not disappoint! Smooth. Delicious. Friends loved it too..
My first love is tequila. Born and raised in California, so very easy access. Grew up with Hispanic family who educated me in good tequila. Any of Casa Noble's tequila will be solid stuff, but this one is unique and worth seeking out. Truly unique! Notes of oak resin, vanilla, caramel, and mature agave. A very smooth but very bold taste. Very nice. Flavorful and smooth. Complex flavor profile though. Depending on the day I get a different note. Nose: like rum, sweet, chocolate, prune Taste: caramel, dark chocolate Very nice sipping tequila for rum lovers.